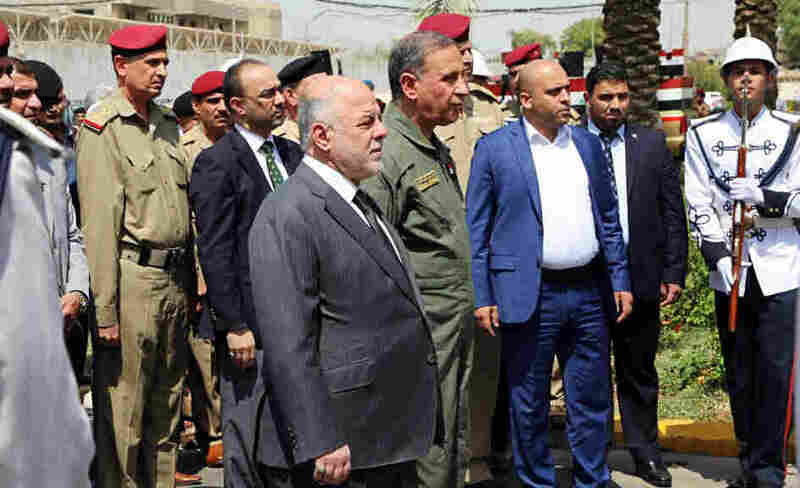 Iraqi Prime Minister Haider al-Abadi (center) attends a funeral for two generals killed in fighting with Islamic State militants in Ramadi, west of Baghdad, in August. In an interview Monday with NPR, the Iraqi leader called on the U.S. to provide more airstrikes but said his country does not want ground forces from the U.S. or any other country. Iraqi Prime Minister Haider al-Abadi said his country wants the U.S. to provide more airstrikes, weapons and intelligence in their joint battle against the Islamic State. But he stressed his opposition to ground troops from the U.S. or other outside nations, fearing Iraq could be turned into a major regional war. In a wide-ranging interview Monday with NPR's Kelly McEvers, the Iraqi leader also called on the U.S. and its coalition partners to focus their air power on Iraq's western border with Syria, saying Islamic State fighters have been able to enter his country far too easily. Abadi said he welcomed the help from the U.S. and other coalition partners but was specific in describing what he did and didn't want from the Americans in the fight against the Islamic State, which he referred to by its Arabic acronym, Daesh. "I have to admit, this support and this air cover is still limited," the prime minister said in a telephone conversation from Baghdad. "We can destroy Daesh. I think we have many forces on the ground who are fighting Daesh. We can advance on Daesh. But we need proper intelligence and proper air cover and support." Many U.S. critics say the Iraqi military has performed poorly in its battle with the Islamic State and needs additional help, from either Western or Arab ground troops to defeat the extremists. But Abadi was adamant this was not the case. "We don't want boots on the ground. Full stop," he said. "We don't want combat troops on the ground to carry [out] military missions on the ground. We don't need that." The U.S. has been bombing the Islamic State forces in Iraq and Syria since the summer of 2014, carrying out some 9,000 airstrikes. There are some 3,500 U.S. forces in Iraq who are conducting the air war as well as training and advising the Iraqi military. But President Obama has consistently opposed any ground combat role for the U.S. forces. Obama has faced critics who say he should step up military action against the Islamic State, also known as ISIL, because the current campaign has progressed much more slowly than many anticipated. In an interview broadcast on Morning Edition on Monday, Obama defended his policy in Iraq and Syria, referring specifically to attacks by Republican presidential candidates. "Well, when you listen to them, though, and you ask, 'Well, what exactly are you talking about?' 'Well, we are going to bomb more,' " Obama told NPR's Steve Inskeep. "Well, who is it you are going to bomb? Where is it that you are going to bomb? When you talk about something like carpet-bombing, what do you mean?" "If the suggestion is that we kill tens or hundreds of thousands of innocent Syrians and Iraqis, that is not who we are," the president added. "That would be a strategy that would have enormous backlash against the United States. It would be terrible for our national security." In the U.S., the conversation about the Iraqi war often centers on the cities the Islamic State still holds, including Ramadi, west of Baghdad, and Mosul, the largest city in the north. But Abadi emphasized the long desert border between Iraq and Syria, saying it remained far too porous. "Daesh is controlling both sides of the border, on the Syrian side, on the Iraqi side. And there are many foreign terrorists who are crossing from Turkey to Syria to Iraq. And there is a lot of smuggling of oil and other things to finance the terror machine of Daesh. And this ought to be stopped." U.S. air support was crucial to a recent operation in northern Iraq, in and around Sinjar, that helped drive out Islamic State forces and ended the group's control of the main highway connecting northwest Iraq and northeast Syria. But Abadi said much more needs to be done in the vast border region. The Iraqi leader was also asked about the U.S. presidential campaign, and he urged American politicians to consider the weight their words may carry in Iraq. "I understand this political democracy in the U.S. ... but I always tell them, please know that whatever you say has an impact here on Iraq," Abadi said. "We are fighting a very, very hard war against this terrorist organization." "When we hear you have an army of 100,000, armies from all over the region to go in [Iraq], that will cause all sorts of alarm here," he added. "What sort of army and who's controlling the army? What do they do there? Are they going to occupy Iraq and Syria?"